We are excited to announce that we can offer 15 and 30 hours Nursery provision! 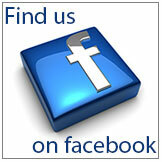 If you would like to arrange a viewing of our wonderful school, please phone the office on 01229 462753. If you would like to apply for a place in our Nursery, please fill out the following documents and return them to the school address. We currently offer several provision options for our Nursery children. We currently have 10 Nursery children who join Reception and Year 1 in Dolphin Class. 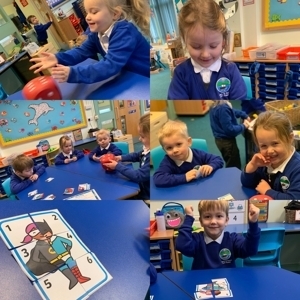 They have the opportunity to engage in Maths, Phonics and Literacy input with Miss Ritchie. 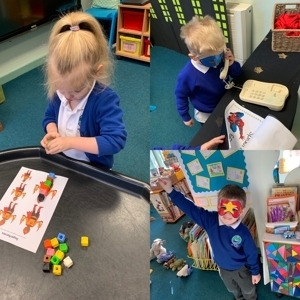 They then take part in learning activities with an adult including focused tasks, mark making, craft activities, continuous provision, outdoor learning and child-initiated play. Each child has their own 'Learning Journey' which documents everything we get up to on a daily basis aswell as any pieces of artwork the children may produce. We also use an observation and assessment tool called Tapestry. Parents can connect to their child's account and look through their fantastic achievements with a description and picture to help explain what they have been doing. Here are some pictures of our current Nursery children enjoying lots of fun activities within Dolphin Class. As you can see, they throw themselves into learning and are making a fantastic start to their journey at ISP! At the moment, each week in Maths we focus on a different number. 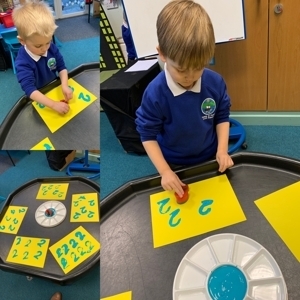 The children take part in many different activities to help build on their number knowledge. Our current topic in Dolphin Class is Superheroes. All of the children love playing in our 'Superhero Headquarters' role play area. 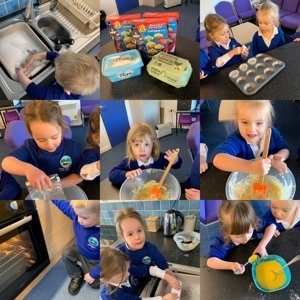 The Nursery children were also given the chance to take part in some baking. They made Superhero themed cupcakes for all of Dolphin Class. Everyone agreed that they were very tasty! At Ireleth St Peter's, our children have the opportunity to join their class for 10 swimming sessions in the Summer Term. These are a fantastic way to introduce the children to the water and to start building vital swimming skills from an early point in their school life. They learn skills such as floating, kicking, water buoyancy and how to stay safe in the water.